Home Entertainment 5 Questions With 5 Questions with Anthony Evans, Jr.
NASHVILLE, TN — Anthony Evans Jr. shares the name with his famous father, pastor, speaker, author Dr. Tony Evans. But Anthony Jr. is clearly carving his own path to success on his own terms. He’s a top worship leader and Christian recording artist who thrilled national audiences as a top contending contestant on NBC’S hit show The Voice during season two. 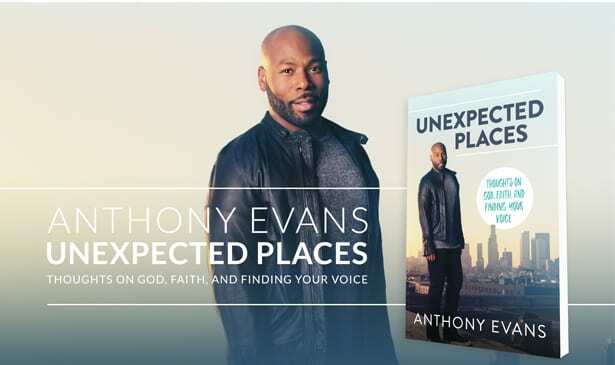 Anthony has now released his new memoir, Unexpected Places, which chronicles his journey from growing up in the ‘spotlight’ of the church, being a preacher’s kid, and bouts with self-doubt and depression. Too often, African American men (especially in the church) do not speak up about their feelings and almost never about the struggles with depression. Anthony bravely takes on this topic while sharing his story of finding his purpose. During the summer received rave reviews Anthony received rave reviews for his role as ‘Beast’ in the Disney production of “Beauty and the Beast” at the Hollywood Bowl in Los Angeles, where Anthony now lives. Prior to the west coast move, he lived here in Nashville. This week Anthony answers 5 Questions about his career, which includes his time of living in Music City. TRIBUNE: What was your parents’ initial reaction about you writing this book? Anthony Evans Jr: I talked to them about it, you know from the perspective of them being my parents and me respecting them in that role, but then also my dad has authored a hundred books so I obviously speak to him about his experience, my mom has also authored a few books too. So, I wanted to talk to them from a place of one; respecting them because it is a memoir it’s not a book about something outside of me. I wanted to make sure that I was respecting them, so I definitely had them read through it and make sure there was nothing in there that they- that would bother them because I wanted to respect my family. I wanted to start the book project in kind of like a chronological order. I wanted to start with my experience as a young person growing up in a ministry family like the one I’m in and then I wanted to kind of talk about the formidable years and how it felt to be behind the scenes of being the kid backstage where my dad was speaking at Promise Keepers before 65,000 men and how that felt to hear them yell and erupt as my dad was speaking at this large event. Everybody is thinking that is great to have him as a dad, and I’m thinking I could never be him. I wanted to lay a foundation where my mind was in the process of growing up because I’m so grateful for my family but there are some things that come along with being in ministry and a kid of ministry, that can make things a little bit more complicated along the way. TRIBUNE: Were you expected to follow exactly in your father’s footstep, maybe starting with being an Associate Pastor? Anthony Evans Jr: No, not at all. My dad would sometimes make jokes about me being the next Tony Evans (he laughs) But then my mom would be like ‘Tony, don’t make him feel that pressure. I know you’re kidding but he may take you seriously.’ My dad and my mom just always wanted me to be an individual and be my own self-man. TRIBUNE: I understand that you once had an interest in attending Texas A & M. What did you originally want to pursue as a career?’ Anthony Evans Jr: I wanted to be a veterinarian, focusing on large animals. What people don’t know about me is that I love the outdoors. I have horses, that I love riding…One of my horses back in Texas is name Gideon. When I’m not on stage trying to look slick and doing all that, I like being outside with nature. So, becoming a vet was where I was headed. TRIBUNE: What was your experience like of living here in Nashville? Anthony Evans Jr: My experience in Nashville was very interesting. Some of the closet friends that I have in life right now were people that I met while living in Nashville. But industry wise, I noticed that Nashville was specifically crafted for a certain kind of person; a certain kind of singer, and a certain kind of songwriter. If you’re not innately that person, you feel like you’re trying to become somebody else in order to be successful. Living in Nashville taught me that I had to redefine what success was because if I manipulate who I am, in order to go and become quote-unquote ‘successful,’ then I then cannot go take that big check that I get for manipulating myself and then go write a check for peace, you know what I’m saying? So, I had to redefine success – success was not necessarily accomplishing number one songs because nobody was making me change myself in Nashville but I knew there was a formula and this formula didn’t work for me…I felt like Nashville had me manipulating my songs, manipulating core changes, manipulating all these different things to become what the industry was wanting but that wasn’t innately me so I was miserable trying to, you know deal with. For some people, it’s them, it’s like this is who they are, and it works. But for me, it wasn’t me. TRIBUNE: What are some of your next projects? Anthony Evans Jr: For the rest of the year I get to do a trip to Israel with my family a ministry trip we have been inviting individuals to come with us so we going to – Tony Evans is going to teach from all the spots you know all the actual places you read about…I’ve started a production company called Sherman James Productions, which is my grandfather’s name. We produced in-house, all of my family’s events. So, this fall I have events with my father and events with my sister Chrystal, who has a song and book, also and then next year we’ll jump into events with my other sister Priscilla (Shirer). We have a lot going on that I’m very grateful for.